A massive foundation pour for Miami Worldcenter’s Paramount Tower is planned for this weekend, days after the city granted final approval for a plan for the developers to switch to outdoor retail from an enclosed mall. A 700-person work crew will work in 3 shifts over 30 hours. Supermix Concrete, which is Florida’s largest independent producer of concrete products, will utilize 100 concrete trucks delivering 1,300 ten-cubic-yard loads each trip. 120 yards of concrete poured every 6 minutes. Approximately 13,000 cubic yards of concrete weighting 52,000,000 pounds will be poured into the massive excavated hole for the foundation: 32,000 sq/ft by 9 feet deep and 10,500 sq/ft by 6 feet deep. Foundation measures 222 feet by 142 feet by 9 feet deep and 65 feet by 142 feet by 6 feet deep. The foundation is supported by 431 Augercast pilings: 30 inches in diameter and 142 feet long. 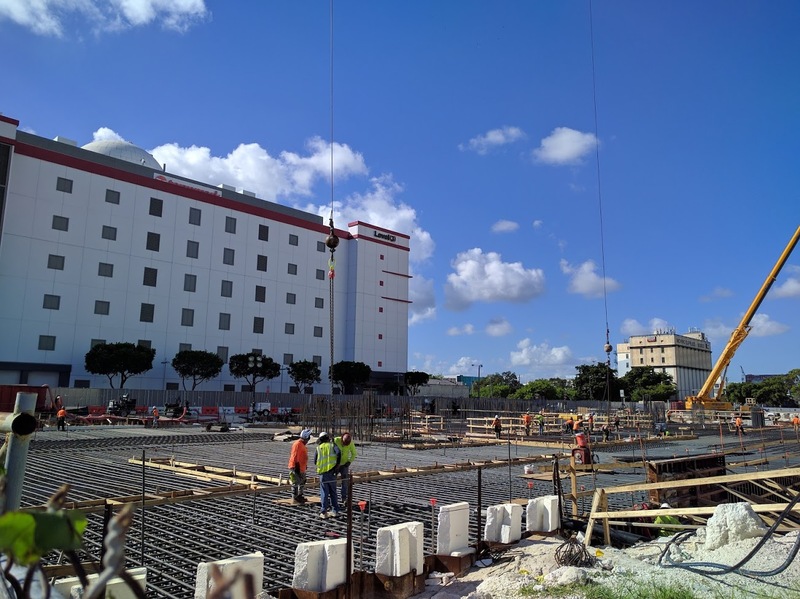 Supermix Concrete will supply the concrete from 4 ready-mix plants located in Miami. Each plant has 2 batches. Steel sheet piling was utilized to brace the soil. 6 temporary wells drilled for dewatering system and more than 8 dewatering pumps have been working 24/7 for almost 5 months. Coastal Tishman will place 4,800,000 pounds of high-strength reinforcing steel in the foundation. 6 truck mounted concrete pumping booms located around the perimeter will place the concrete. 300 drivers working in 3 shifts will be needed for the continuous pour which will run approximately 30 hours. Last week, Miami’s Planning Department granted approval for modifications that will see the Worldcenter switch from an indoor mall to a high street retail scheme. The WorldCenter and Paramount are going to be AMAZING! It’s a super high end building with over 30 amenities, in an area that is going to be completely brand new and EVERYTHING will be walking distance. Yes, I’m jaded because I bought there, but so excited to hear this news!! If I could add one criticism – it would be nice to have a monthly email from the developers to update the future owners as to what’s going on. All we get are the occasional pictures / blogs that show up on websites – it would be nice to receive a written progress report / update. Congratulations.. It is a beautiful building, and close to everything… the entire MWC and Rail project will revive this section of downtown. Now this city has just got to get the Miami Innovation District going! That was the best master plan of any of them! Looking forward to Paramount, MiamiCentral, and the 7th Street Apartments with its accompanying retail and night life to change the landscape forever. The building design is outstanding. It will be very iconic for Miami. simply put….a beautiful project and thrilled to see progress is real…..
can’t wait, build it already! Great addition to Miami’s skyline!. Happy to see this happening. Go Miami!!! ? Get rid of the evidence NOW!